The terrifying encounter left the legally blind university student and her dog Hughie shaken but uninjured. It was the pair's most recent altercation with dogs which have been allowed to roam free by their owners and Ms Damarra says she fears it won't be the last. So she has thrown her support behind a new campaign to be launched this Wednesday for International Guide Dog Day. Ms Damarra said the first she knew of the attack was when she felt the large dog jump on Hughie's back. "I felt the weight through the harness. Do you let your dog off leash even when they're not meant to be? This poll ended on 29 April 2014. "I dropped the handle and Hughie was trying to get this dog off him," she said. "I could feel him shaking, it was really terrifying." The dog's owners eventually intervened to separate the two animals. "Even if there's no physically pain, there can be psychological trauma for both me and the dog," she said. "That can be dangerous, the dog can become very anxious and not want to work. "I'm very lucky Hughie was OK."
But it isn't only attacks which can cause major problems for guide dog users like Ms Damarra. Dogs which simply want to play can also prove dangerous. "It can distract the Guide Dog when he's worried about these other dogs around me," she said. "You might have the loveliest dog in the world, but it can make it very difficult for me and my dog. It can endanger the safety of all of us." The Guide Dogs Australia public education campaign Take The Lead will call on dog owners to ensure their animals are always walked on a lead. 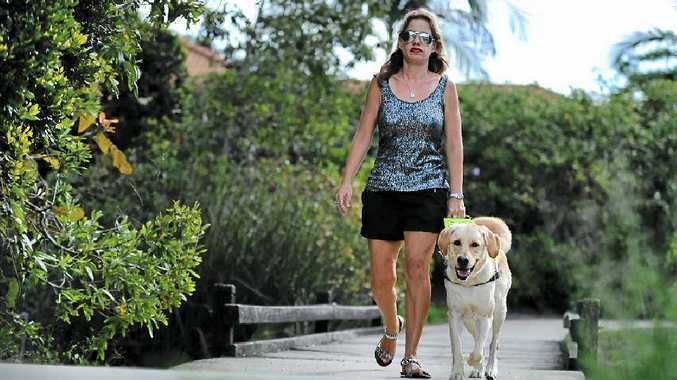 Guide Dogs Queensland CEO Chris Laine said the number of attacks on guide dogs was "alarming". "Encounters with off-leash dogs could cause serious injury and trauma to both the handlers and their guide dogs," he said. "In rare serious cases, attacks can result in premature retirement of a guide dog, which costs more than $30,000 to train. "Any distraction to a working guide dog can put its handler's safety at risk. "For example, if a guide dog is distracted while guiding its handler across the road, the consequences could be disastrous. "We're encouraging dog owners to take the lead to help create a safe community, not just for guide dogs and their handlers, but for everyone."